Kurt Russell and director John Carpenter have made a good number of films together, but in fans’ minds, their first concerted effort, “Escape From New York,” appears to be the most fervently adored one. The reason is quite simple, I guess. 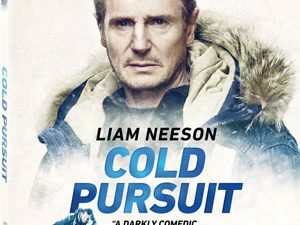 The film has found the perfect recipe for thrilling action entertainment in a merciless and savage dystopian world, and it features a figure that comes across like a superhero – only that he is utterly human. 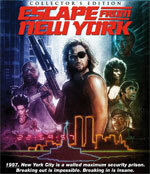 “Escape From New York” has been released on Blu-Ray before by MGM Home Entertainment in a version that wasn’t exactly wowing fans, so I was very eager to see how this new Special Edition would fare, particularly, because it has been prepared and released by none other than the great Shout! Factory. “Escape from New York” plays in what used to be the near future. 1997, our past, to be exact, but given the film’s 1981 production, the story took place almost 20 years in the future at that time. The human race has eventually made its own existence a living hell, succumbing to crime and violence and the entire island of Manhattan has been turned into a maximum security prison. Without guards, without electricity and ultimately without much light, the only way in or out is over one bridge, which is mined and hence impassable. No guards take care of the prisoners in Manhattan and a subversive culture has developed in this self-reigned pandemonium. The strong survive, the weak ones are killed – if only for sheer pleasure. One day Air Force One, with the President of the United States (Donald Pleasance) on board, crashes inside Manhattan after his plane has been hijacked. A small police force enters the prison for his rescue but find only his escape pod – empty! With no one really daring to mount a rescue mission inside the prison, police chief Hauk (Lee Van Cleef) comes up with a plan and uses a prisoner Snake Plissken (Kurt Russell), to infiltrate Manhattan for their purposes. Why would the notorious bank robber want to do it? Full pardon is one incentive, but with an explosive charge implanted in his neck, the officials also threaten to blow Plissken to bits if he doesn’t cooperate. Incentive enough, I suppose, for even the most hardboiled character. Under cover of night Snake Plissken enters Manhattan, stealthily using a soaring plane that he lands on top of the Twin Towers. Soon, the streetwise guttersnipe tracks down his first leads. But as the first pieces of information crop up about the President’s whereabouts, the prospect of rescuing him trend towards zero. 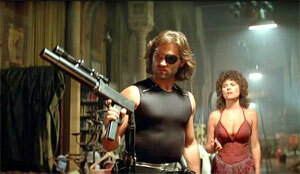 With his own life at stake, Plissken ventures deeper and deeper into the abyss of human scum that now rules Manhattan. Inventive and imaginative, the premise of the film has a lot of promise and with his masterful direction, John Carpenter uses his scenario to squeeze every bit of atmosphere out of it. We have seen a lot of dystopian films over the years and “Escape from New York” may no longer have the same coolness it used to have when it was first released, but overall it hasn’t lost much of its grittiness and charm. “Escape From New York” is a seedy dark action film that is full of explosions, gunplay and bad guys – as a matter of fact the entire film is populated by them. It is interesting to note that Carpenter even decided to have the film’s supposed “good guys” drawn in a way that makes them distinctly despicable. Everything in “Escape From New York” is dark, gloomy and dangerous. 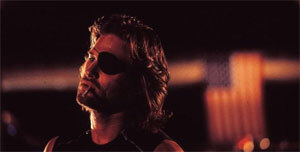 It is a dog-eat-dog world and Carpenter’s unflinching use of the premise makes “Escape From New York” one of the most unique action films of its period. The film is perfectly cast with Kurt Russell in the lead. Moody, aggressive and tight-lipped, he is a macho without inhibitions. Purely acting on his instincts, Snake Plissken, the way Russell portrays him, is a walking menace, a loaded weapon ready to go off at any time. Hardly surprising “Escape From New York” has become the film that many consider really launched Kurt Russell’s movie career after many years of television work, and chiseled out the edgy characterizations we have gotten to love over the years. Russell is supported by a phenomenal cast consisting of well-known and respected faces, such as Lee Van Cleef, Ernest Borgnine, Donald Pleasance, Adrienne Barbeau, David Warner, Harry Dean Stanton and countless others. Together they create an organic underground world in which a blistering war rages every minute of the day. Shout! Factory has earned a reputation for creating some of the greatest Special Editions for niche movies these days, and this release of “Escape From New York” does not disappoint either. If you weren’t to thrilled about MGM’s high definition transfer years back, you will be pleased to hear that the transfer Shout! is delivering here is absolutely stunning. It is rich in color and offers an incredible level of detail. Noise or grain is virtually invisible. Colors are powerfully rendered – although for many parts, John Carpenter deliberately chose a subdued palette that makes heavy use of shadows to frame the image, as well as grayish tones to underscore the cold and sterile nature of the “good side” in the movie’s beginning. Once we enter pandemonium, the film pulls all the stops and presents us with earthy tones and shades, as well as deep shadows that add to the ominous atmosphere. Blacks are perfectly reproduced in the transfer without losing detail, giving the transfer incredible visual depth. Shadows never break up and always have enough fill-in to allow for details, yet blacks are impenetrable and solid throughout. Skin tones are warm and very naturally rendered throughout, giving the film a rooted and always natural feel. Shadows are flawlessly rendered and never lose detail, making sure the image just pops off the screen at any moment in time. In a word, it is the transfer fans of the film have been waiting for. “Escape From New York” wouldn’t be the same without John Carpenter’s ostinato music. Repeating small synthesizer motives again and again, Carpenter is a master when it comes to creating suspense through the use of minimalist music. I am glad that the music, as well as all other audio elements have made it nicely onto this Blu-Ray Disc in a DTS 5.1 HD Master Audio version. It is clean and balanced and makes good use of the surround channels throughout. Without noise or hiss, the audio track has a wide frequency response with good bass and clear high ends that are free of sibilance or distortion. Dialogues have been well integrated and are well-balanced so that they are always understandable and never drowned out by the film’s sound effects or the music. One of the things fans are probably looking forward to the most are the bonus features on this release. The disc contains a number of supplements that have been released before as part of DVD and Blu-Ray releases, but Shout! Factory went all the way with this Collector’s Edition and has prepared a host of new extras. Three commentary tracks accompany the film. The first on is the much acclaimed track by John Carpenter and Kurt Russell. The two of them have traditionally created very good commentaries and it is no surprise that this track has found its way onto the release once again. The next track is with producer Debra Hill and production designer Joe Alves, which has also been released before. As a new supplement, Shout! has also prepared a brand new commentary track featuring Adrienne Barbeau and director of photography, Dean Cundey. The track is interesting but unfortunately due to technical difficulties, it is barely audible. The overall volume of the track is so low that at first I thought it did not exist at all. Only upon cranking up the volume way, way up, I heard the conversation, and even then I found it to be very uneven with Barbeau being noticeably louder than Cundey. A whole host of new featurettes are also included on the release, covering countless aspects of the movie and its production. Replete with interviews, you get a look at the visual effects and an interview with co-composer Alan Howarth about the film’s music. Kim Gottlieb-Walker will also take you on the set of the film in an interview featurette that is ripe with a collection of still photographs. A number of other interview featurettes further add to the new features. Deleted scenes, the “Return to Escape from New York” featurette and an extensive photo gallery, culled from previous releases rounds out the release. John Carpenter has earned his reputation and fan-following for a reason, and “Escape From New York” is a perfect example, what makes this filmmaker so special. A great premise, absolutely cool atmosphere and imagery, commanding performances and a suspenseful narrative make up this movie and put it above the standard crop. I couldn’t be more thrilled with this Collector’s Edition release that Shout! Factory has served up here. Dump all your previous versions and get this brand new and significantly improved copy of the film right now!